Dhaka – Bangladeshi Prime Minister Sheikh Hasina has urged the world leaders to work together to fight the deadly diseases like AIDS, malaria and tuberculosis. She also called for working with commitment, determination and solidarity to fight these preventable and treatable diseases according to a combined global plan. “I firmly believe that AIDS, tuberculosis and malaria are preventable and treatable. 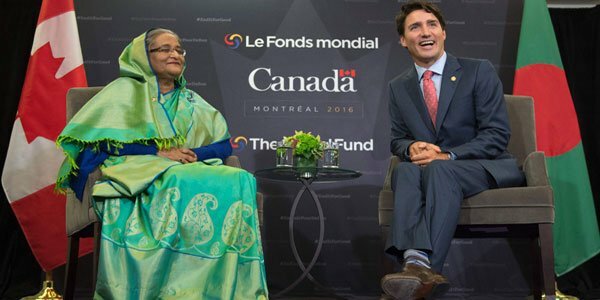 It needs commitment, determination and solidarity … let’s make a pledge to work together towards that end,” Hasina said while addressing the opening session of the 5th Global Fund Replenishment Conference at Hyatt Regency Montreal in Canada on Friday. The two-day conference began Friday with a view to further gearing up efforts to exterminate the epidemics of the world’s three most devastating diseases by 2030. The Global Fund is the world’s main funding body for activities related to the prevention and treatment of AIDS, tuberculosis and malaria. The body supports programmes throughout the world, with a focus on those areas where the burden of disease is the heaviest. Hasina said health security is a critical aspect of development and access to healthcare is critically important for society. “It depends on poverty alleviation, food security and even climate change management,” she said adding that development of an equitable, affordable and sustainable health system for all remains a challenge. Considering the fact, the she said that her government gives top priority to health security by investing in health infrastructures, products and services. Hasina also sought the Global Fund support to her government’s strides to ensure health security for all the people of the country. “My government attaches high priority to health security by investing in health infrastructures, products and services … we expect Global Fund to support us in our efforts,” she told her audience. Hasina said her government has taken move to eliminate malaria by 2020. Bangladesh has been maintaining low prevalence rate in HIV/AIDS for the last two decades and several institutional approaches have been undertaken in this regard. We have made education free for girls up to the 12th class and introduced various types of stipends for them … this has not only resulted in significant improvement in school retention of girls but also reduced under-age marriage, maternal and child mortality, she said. She said violence is seriously impacting physical and mental health of women. “We have been maintaining a ‘zero tolerance’ toward all sorts of violence and discrimination against women,” she said. The government has set up more than 16 thousand community clinics and union health centres to deliver quality health services in order to serve poor and marginalized sections of the people. “Most of the staff working in these clinics are women,” she said, adding 30 types of medicine are being provided free of cost from these centres. The premier said Bangladesh recognises the significant contributions of international partners, including the Global Fund, in strengthening the country’s health sector. Canadian Prime Minister Justin Trudeau, Senegalese President Macky Sall, Togo President Faure Gnassingb, Executive Director of the Global Fund Mark R Dybul and Secretary-General of the International Organisation of La Francophonie Michaelle Jean also spoke in the programme, according to state-run Bangladesh Sangbad Sangstha news agency. The Canadian Minister of International Development and La Francophonie Marie-Claude Bibeau moderated the session. The Global Fund’s Replenishment Conference is held once in every three years. US President Barack Obama hosted the previous Replenishment Conference in Washington in December 2013.